“Jesus Christ Superstar” tells a familiar, Biblical tale in a completely non-traditional, modern fashion. 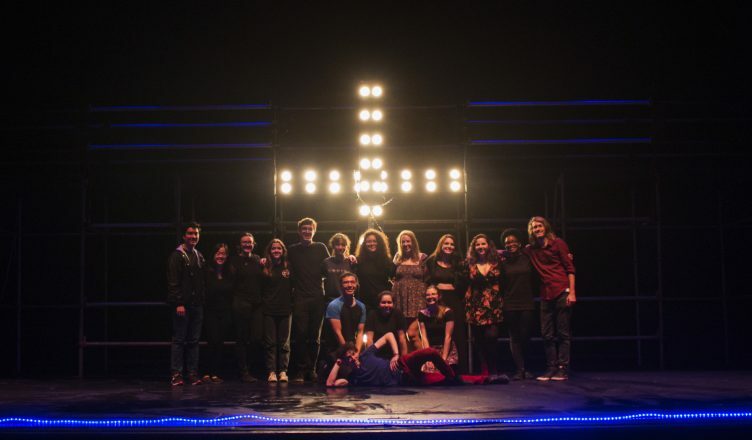 “Jesus Christ Superstar” opened the night of April 7 in Mandeville Auditorium at UC San Diego, showcasing the talent of students across all colleges and majors. Produced by Muir Musical, a student organization that directs and performs a new play each spring, this play is not your average Sunday School class. Act one opens with an emotional pantomime depicting Jesus (Andrew Paiva) saving the prostitute Mary Magdalene (Isabella Calabrese). While Mary does grow closer to Jesus after this moment, the plot pays special attention to Judas (Jake Bradford) and the transformation of his relationship with Jesus following this pivotal scene. Judas is not portrayed as the conventional heartless betrayer, but rather a confused friend, torn between how his views of Jesus have changed and the closeness they enjoyed before. Ultimately, he is forced to fully admit his growing doubts when confronted by the persuasive, manipulative Pharisees (Shane Ramil and Clara Shuler). The play goes on to portray the last week of Jesus’ life, beginning with Palm Sunday and moving toward his final moments on the cross. Rather than communicate this Biblical tale through dialogue and hymn,, “Jesus Christ Superstar” uses song and rock n’ roll to tell its story. Each of the actors executes their role with deliberation, holding each note with passion. With every song, the plot not only progresses, but the emotions of characters are also divulged. Despite the ostensible implications of its upbeat title, “Jesus Christ Superstar” truly delves into the serious topics, spanning betrayal, love, revolution, religion, and guilt. The weight and artistry of the performance extends beyond the acting and music and into the play’s very setting and costumes. The set on stage –– consisting of a basic metal framework with two levels –– is constantly evolving. The cast rearranges attachable staircases leading to the upper level as needed throughout the performance, using the set changes to create an interactive experience. This interactivity is further highlighted by the mood lighting that sweeps the stage from both above and within the framework, reflecting visually scenes’ implied emotions. Costumes are clearly evocative of traditional Biblical imagery but are made out of modern clothing styles. For instance, to show their wealth and solidarity, the Pharisees all wear matching suits. The apostles and Jesus wear flowing shirts and pants of browns and tans, with the exception of Judas dressed in blues and grays. The simplicity of the backgrounds and garments allows the focus of the play to rest entirely on the actors’ performances. Tickets are free to undergraduate students and available at the Price Center Box Office. For others, tickets can be purchased online for $5 through the Price Center Box Office website as well as through Muir Musical’s website. The remaining performances are on the evenings of April 13 and 14.